Understanding of the history and development of organization theory has recently made new advances through new work emerging on the history of management thought as well as through the institutionalization of critical approaches to organizations and organizational knowledge. There is a need to revisit the historical schools and their meaning for the contemporary debates in organizational theorizing, as well as to take a critical approach to the succession of paradigms. 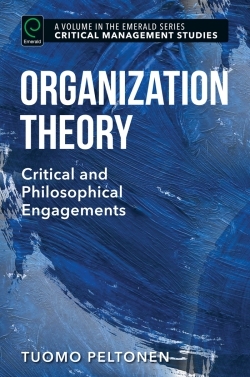 In addition, there is a continuing need in organization theory to distinguish between different metatheoretical influences behind new theories. In sum, a new version of the total historical development of organization is needed. This book addresses that need by directly using the historical sources of organization, instead of offering a secondary reading of the classics. It also shows how turns in social and cultural history intertwine with the changes in philosophical assumptions and social theoretical paradigms, without resorting to a simplified linear narrative. The book critically engages with both continuity and discontinuity between the different theoretical perspectives.